Saturday February 14th 1925 Very pleasant again. I sewed some and read the papers. Letter from LD L and Grace Taylor. I wrote Hattie, mailed the letter and did errands. I wrote to L D L a long letter and mailed it when I went to the play. A valentine from Nellie McCall and Major Lowe. Sunday February 15th 1925 A fine day. To SS and church. Talked with Mr Brink after dinner. Later had a nap before I dressed for supper Had letter from Hattie and Valentine from Cora and Warner McCall. To Baptist church later Monday February 16th 1925 I did some sewing in forenoon. The two ladies came back from Coral Gables at noon. I took a nap some rain in evening. So spent evening here in parlor. Tuesday February 17th 1925 I was on the porch with Mr Cummins for awhile. Then went to Club Room for R R Folder and called at Pickens. After dinner I rode to Daytona with them. A fine ride on the beach. Called at Dunlaps, Back to DeLand in time for supper. 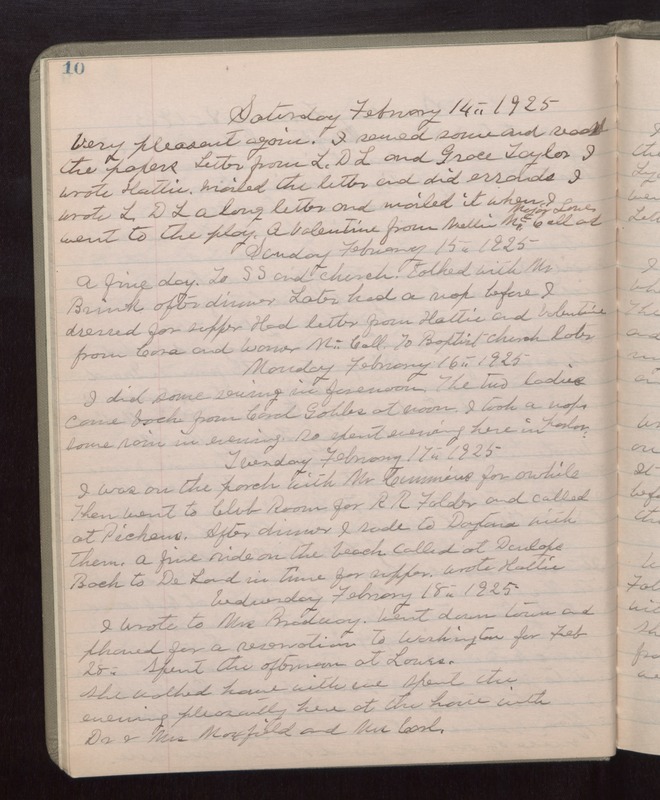 Wrote Hattie Wednesday February 18th 1925 I wrote to Mrs Bradway. Went down town and phoned for a reservation to Washington for Feb 28th. Spent the afternoon at Lowes. She walked home with me. Spent the evening pleasantly here at the house with Dr & Mrs Maxfield and Mrs Carl.